The Ultimate Off Road Carry Bag to suit TRED Pro, TRED 1100, TRED 800 and other leading brands such as MAXTRAX and others. The TRED Pro Carry Bag is made from super durable and waterproof canvas material. It features various gear storage pockets for your tow straps, shackles, winch blocks and anything else you need to carry. The extra large front pocket is made from high quality UV stabilised mesh, great for keeping anything you need to dry out and doubles as a great rear wheel trash bag. The webbing straps will attach the bag to your rear wheel carrier, roof racks and anywhere else you can strap it down, they also double as great backpack straps. There is no other recovery gear bag like it. 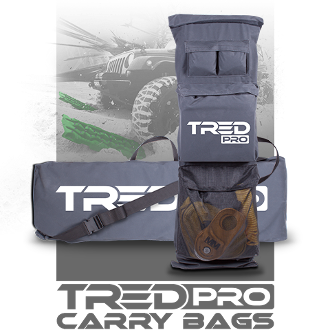 The TRED Pro Carry Bag has been designed to hold one set/pair of TRED Pro or TRED 1100 or TRED 800 traction boards.